From Kanyakumari it is a 250 km ride to Madurai. We’ve made it…barely. After over 10,000 km on the road over the past three months, our bodies are aching in places we didn’t know could ache. The two-wheeled machine which has been transporting us all this time is “exhausted” too. It experienced another “major injury” – another crack right through the middle of its chasis on the way to Madurai, but somehow we managed to pull through to our destination. 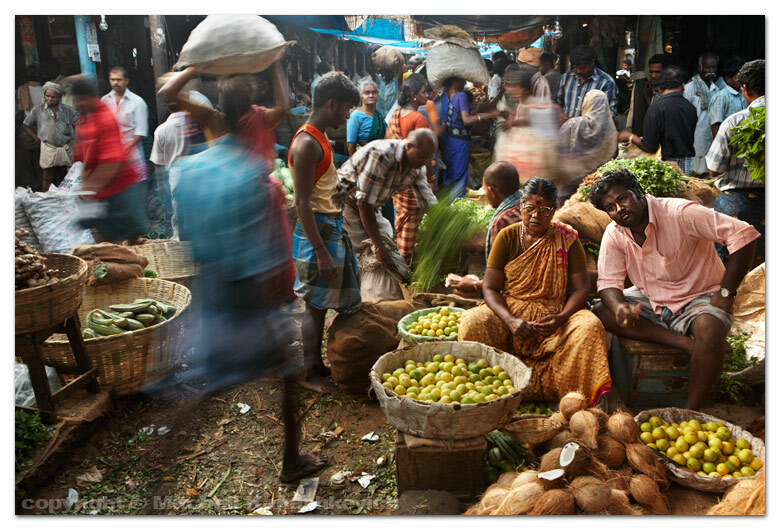 Madurai is a fascinating city. My short time here would not do it any justice. However, I decided to at least have a peek at it, rather than to simply pass it by. Parts of the city are particularly photogenic. 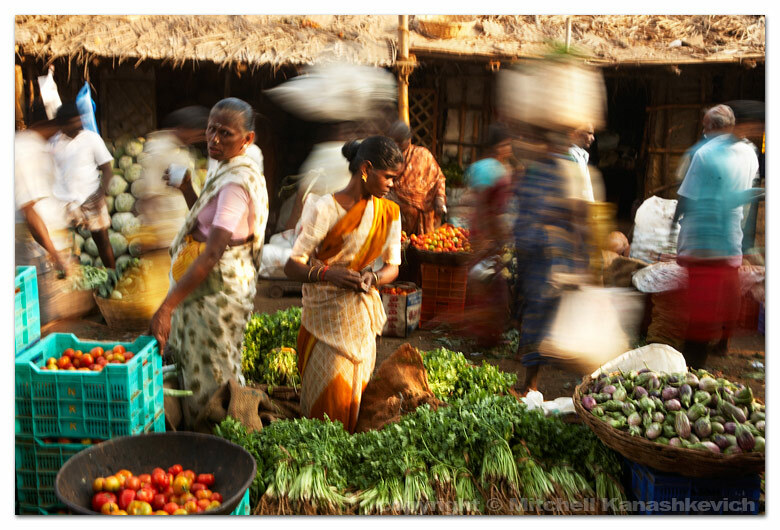 The fruit and vegetable market inside the city is as bustling and challenging to photograph as the fish market in Kollam. I came to this place every morning, I suppose more to absorb the atmosphere than to create any compelling images. Later in the mornings I’d go to the temple, the most famous temple in all of south India and arguably the finest example of Dravidian architecture – the Sri Menakshi. To my huge disappointment there was restoration work being done to the Sri Menakshi during my visit. Its giant, elaborately decorated towers were covered with faded, dry palm leaves. I was left only with post card images of what it looked like and my imagination of how it may look after the restoration. Thankfully the inside of the vast temple grounds was very much intact and buzzing with religious activity. 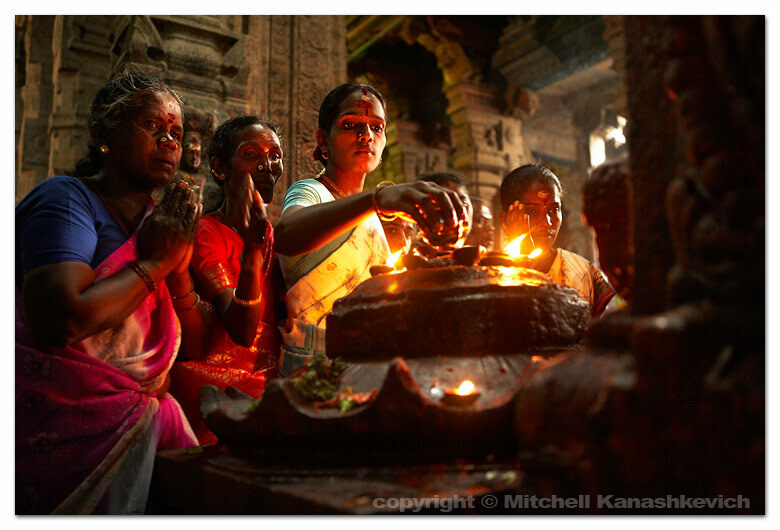 I have a strange feeling in Hindu temples; it is as if I am both – a complete alien and totally at home there. All the rituals, the hundreds queuing up for darshan (blessing) or prashad (blessed food) and bowing to the Gods carved out of stone; on the surface none of it makes much sense to someone like me. I’m not religious by any stretch of the imagination, in fact I’d say I’m anti-religious at times, but the essence behind every religion is very human and when I think of that, I, as a human being can connect with it. I feel that behind the multitude of layers, the rituals at Hindu temples or for that matter any sites of worship, stand two universal factors – misery and hope. 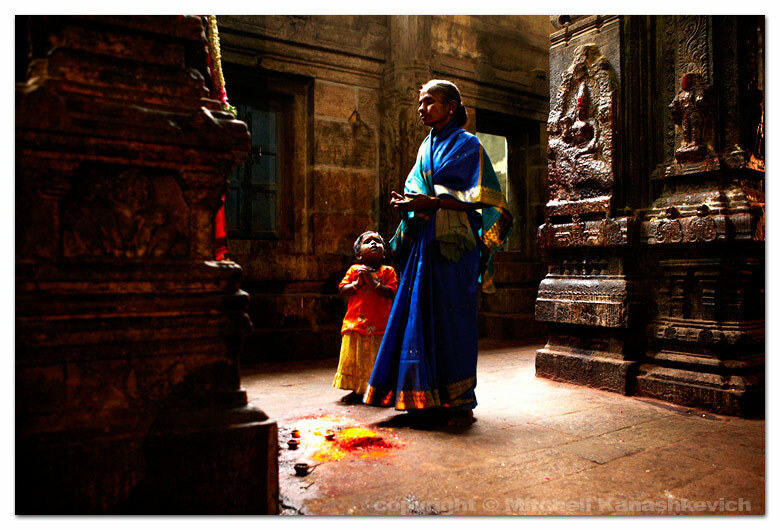 Misery and hope go hand in hand in and around the Sri Menakshi Temple. A poor farmer’s family spends the night on the pavement by a make-shift fire, a deformed man begs for money, a newly-wed couple makes an offering and the fat businessman who has “made it” bows down to the Shiva statue – there is a degree of hope and misery that drives all of these people. They plead for a better life, money, happiness, forgiveness and they all hope that they will be heard by the divine. There isn’t an individual in the world that doesn’t suffer or hope. And as for surrendering to the divine, if it’s not God that a person looks to, it’s love, work, alcohol, drugs. The essence remains the same, only the layers around it change. Knowing this makes me feel at ease about the blanks in my knowledge of Hinduism. I can fill in those blanks. What makes me comfortable is the fact that those in the temple are humans, before they are anything else. Their actions are a manifestation of their cultural upbringing, but these actions are driven by the same misery and hope that I and every other human feel. We spent three days in Madurai. Our next stop is Bangalore. How we have to get there is another story. The last ten or so days have been intense. We have covered over 1000km of road, sometimes extremely bad road, pot-holed, narrow and full of half-competent drivers. But riding on these kinds of roads often brings unexpected amusement. Close to the Madhya Pradesh/Rajasthan border we came across a ‘holy man’. He had obviously been walking along the road for a long time, but he was being followed by an entourage – people with sun-blocking umbrellas and cars with large signs promoting his pilgrimage. Not so unusual for India, except for the fact that the man was completely naked. Less than one hundred kilometers later we were treated to a sighting of an almost literal clash of two worlds – the ancient and the modern. A caravan of bejeweled tribal women with camels and children (most of them on top of the camels) crossed the road as cars and trucks moving at insane speeds somehow managed to slow down in time not to run anyone over. Our first stop was Ujjain – a place of pilgrimage that holds a great significance for Hindus around India. Every twelve years it hosts what is possibly the largest gathering of humans on earth – the Kubh Mela. The next mela is eight years away, so the city was rather subdued when we visited. Ujjain offers a glimpse of the exotic Hindu India that we often see on TV and in picture books. 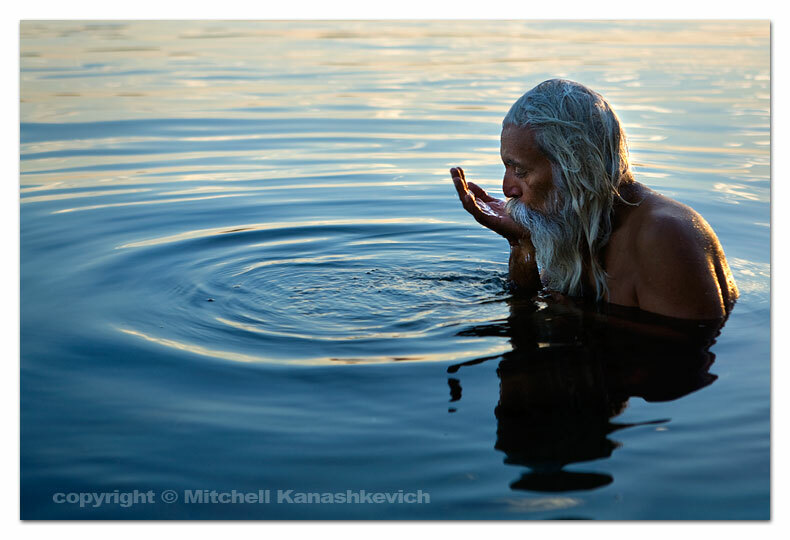 Every morning devotees bathe in the holy waters of the Shipra river, they wash away their sins and make offerings. The Brahmins (priests) at the riverside temples perform various religious ceremonies, the way their ancestors have for hundreds of years, the only difference now seems to be the priests’ short attention span, evident from their constant checking of the mobile phone right in the middle of the ceremonies. Our next stop at the small town of Maheshwar by the Narmada river, was meant to last for a day and a morning, but once we felt the peaceful rhythm of life here and the warmth of the locals, we got ‘sucked’ in and stayed three days. 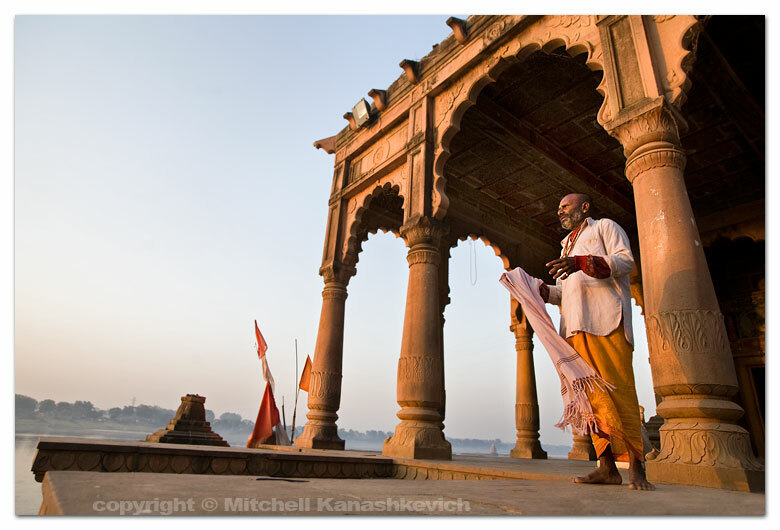 Maheshwar is also a place for religious pilgrimage, but it is much, much lower scale. It is what I imagine India was like a long time ago, before the whole modernization and population explosion occurred. There is definitely magic in the air, perhaps because it hasn’t yet been killed by the blaring sounds from stereo systems and the large rubbish throwing crowds, so common around similar places. A walk along the riverside in Maheshwar is one of the most serene experiences one is likely to have in India and a swim in the Narmada river here at sunset is like nothing else (yes, I braved it and went in, but Narmada is not as polluted as India’s other rivers). Floating in the water and seeing the huge fort and the numerous temples towering above, while the setting sun’s rays painted everything gold felt absolutely surreal. We would have liked to stay longer in Maheshwar, but at this stage time is not a luxury we possess. Our stop at Nasik (another Kumbh Mela destination) was brief, but the next one at Pune was longer than expected. Not that I am complaining, since Pune turned out to be quite fascinating for a place where I didn’t even think about photographing, but more of that in the next post. 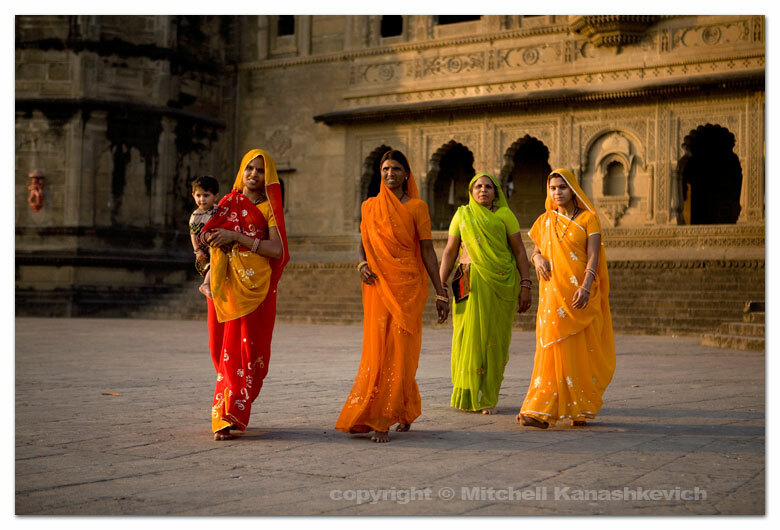 I am posting some images from Maheshwar. The first two (one at the top one below) are of a Sadhu we met at a small, isolated temple on a hill overlooking the Narmada. 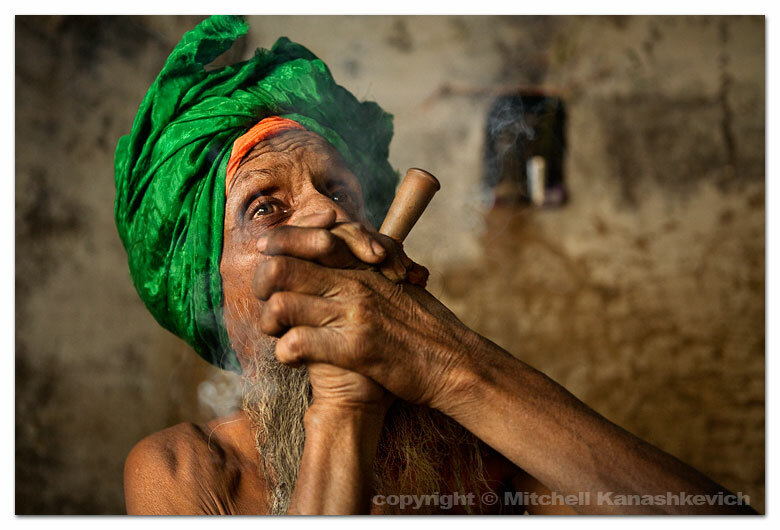 Sadhus are also known as holy men, ascetics and saints in India. In reality they are often very far from anything holy or spiritual. Most that I had come across were simply wanderers, beggars and in worst cases scam artists, in fact I am always cautious when a Sadhu asks me to come over and speak with him. Usually any conversation simply leads to how I should give him money, but there are also plenty of stories of naive travelers being drugged, robbed and having other not so nice things happen to them. If I am in famous pilgrimage places full of tourists I will not even waste my time, but here I was in Maheshwar (which only seems to get a trickle of visitors) and this Sadhu gestured with his hand from his temple for me and my wife to come up. While the isolated location seemed like an ideal place for something bad to happen we decided to go, we simply wouldn’t drink or eat anything offered to us, paranoid maybe, but safe. The Sadhu spoke less English than I spoke Hindi and that is about 20 words. Our conversation revealed which pilgrimage places he had been to (very many). He had many children and whether they were biological or spiritual was not easy to understand, but they did live all over the world. Suddenly he got me to right down an address, which turned into a collection of random names and places in different countries. His children maybe? Finally I managed to communicate that I wanted to photograph him by the window of his room, he agreed, I asked if he could smoke his chillum (the pipe used to smoke opium) he did. There wasn’t quite enough light in the room to photograph without setting the shutter speed too low, so again Tanya helped with the flash from the window side, used in a softbox at 1/64 of the power. The next image was taken outside of the Sadhu’s temple. The sun was setting and the location seemed perfect, with the Narmada in the background. After the little photo session the Sadhu invited us to follow him somewhere, just for five minutes. We got a bit worried, as that’s how those horror stories usually started, but again decided to take the risk. At this stage the Sadhu’s nature seemed quite friendly, even if a little mad. We followed along a narrow path surrounded by vegetation and ended up at what seemed like another temple and a small room. There were houses with people nearby and one young man spoke some English. I asked him whether the Sadhu wanted us to come with him for some particular reason. – No, he just wanted to offer you food and milk, just ‘time pass’. It really didn’t seem like the Sadhu had too much to offer, so we politely declined and instead took down the address of his temple, to send him the photographs. 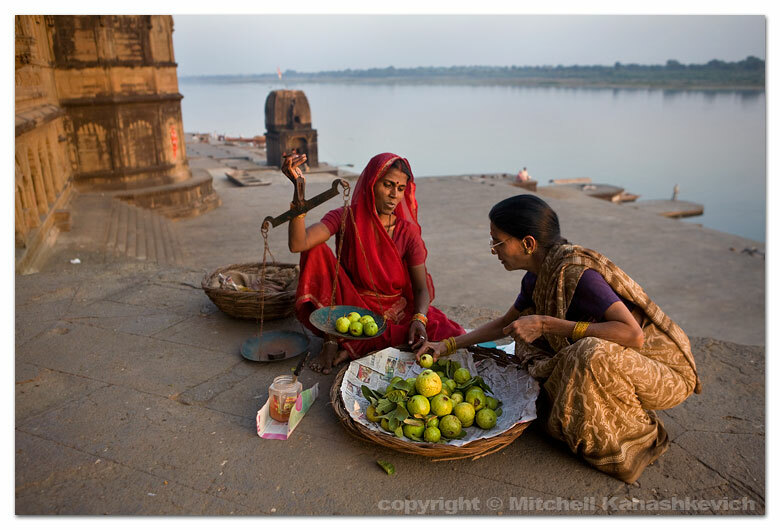 The rest of the photos are just grabs of everyday life by the Narmada river.